Dog Biscuit Recipes: Delicious Homemade Dog Treats | Happy Spaniels! Your Cocker Spaniel will love these delicious dog biscuit recipes! Apart from being fun to make, homemade dog treats are much more healthy and tastier than shop bought because you know and can control exactly what goes into them! Our dog biscuit recipes are very easy and great fun to make, and who knows, once you get started, you might remember just how much you used to enjoy baking! Max always seems to know when I'm baking biscuits for him. He sits in front of the oven, peering through the glass door, and watches them bake, and he won't budge until they're ready to come out! The recipes that follow are some of his very favorite treats and we'd like to share them with you. We hope you have lots of fun trying them. I'm sure your Cocker Spaniel will find them as yummy as Max does, and if you have any of your own dog biscuit recipes that you'd like to share with us we'd love to hear from you! You can make these yummy dog treats in any shape you like. If you don't have a dog biscuit cutter you can roll them into balls or use the top of a small glass or jar to cut rounds. Preheat your oven to 350 degrees F/180 Degrees C/Gas Mark 4 and lightly grease a couple of large baking trays. Sift the flour into a large bowl, add the powdered milk and salt, and stir. Crumble the beef stock cube into the bowl and stir again. (If it's not the crumbling sort, melt in a little boiling water). Add the ground beef, grated carrot, lard or butter, and the egg and mix thoroughly. Continue mixing while slowly adding the water to form a stiff dough. Roll the dough out onto a lightly floured pastry board and roll until the dough is approximately 1/4 inch thick. Cut into biscuit shapes using either a cookie cutter or a knife and place them onto the prepared baking trays and bake in the oven for 25 - 30 minutes. 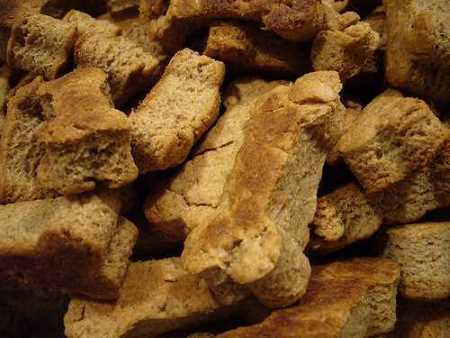 This dog biscuit recipe makes around 60 treats using a 2 inch (5 cm) biscuit cutter. If you want the cookies to harden, simply leave them in the oven until they cool. If you don't have any ground/minced beef to hand, simply crumble in an extra beef stock cube. If you do use an extra stock cube, don't add the salt because you won't need it. I usually freeze most of the biscuits in a zip-lock plastic freezer bag and keep a week's worth of treats in another bag in the refrigerator. If you decide to try this recipe please do let me know how you get on, even better if you have any ideas for improvement, simply click on the link below. Submit your own dog biscuit recipes here! Place the warm water and yeast in a mixing bowl and allow the mixture to dissolve. Add the minced garlic, chicken stock, honey, parsley and the egg and then give it a stir. Gradually add the flour and mix thoroughly. If the mixture is too sticky, add a little more flour. Place the dough onto a lightly floured worktop and knead for 5 minutes until pliable. Roll the dough to a thickness of 1/4 inch (6mm). Using a small biscuit cutter or dog cookie cutter, make your biscuits. If you don't have a shaped cutter, a knife will do the job for you; simply cut out the desired shape. As you cut your biscuits, place each one onto a non-stick baking tray and then bake in the oven for 30 minutes. Turn each biscuit over and bake for an additional 15 minutes or until golden brown. Switch off the oven and allow the biscuits to cool and harden overnight. Preheat the oven to 300 degrees F/150 degrees C/Gas Mark 2. Dissolve the stock cubes in the hot water. Add the milk and the lard or meat drippings and whisk. Mix the oatmeal into the whole wheat flour. Pour the wet ingredients into the blended oatmeal and flour mixture and mix well. Roll out on a lightly floured surface to a thickness of 1/4 inch. Cut into desired shapes using a cookie cutter or dog biscuit cutter. Place on a non-stick baking sheet and bake for 60 minutes. Home-made treats not only taste delicious to your pet but, because you've made them yourself, you know exactly what goes into them! These are one of Max's favorites - he just loves crispy bacon! Add all ingredients into a food blender and mix thoroughly. If you don't own a food blender, mixing by hand is okay, but use a large wooden spoon and use some elbow grease! Drop tablespoon sized portions of the mixture onto a non-stick baking sheet. Place on the middle shelf in the oven and bake for 15 minutes. Switch off the oven and leave the biscuits overnight to dry out and harden. I've included this recipe as an alternative to the meaty biscuits - just in case your Cocker's a vegetarian! Surprised? Well don't be, there are many Cocker Spaniels on a vegetarian diet either because their owners are vegetarians or they have previously suffered allergies to meat. Max and I think this is one of the best vegetarian home-made dog treats we've ever tried. Tip: If you don't have any dog biscuit cutters, you can always shape the dough by hand, or cut your desired shapes with a knife - your Cocker won't mind if they're not perfect! Shape into a ball and roll the dough out to 1/4 inch thick. Cut out shapes with a bone-shaped cookie cutter. If you don't have a cutter you can use a knife to cut out your biscuit shapes. Place onto a non-stick baking sheet and bake for 30 minutes. Homemade Dog Biscuit Recipes...With Peanut Butter! Cocker Spaniels just love peanut butter, and I'm sure your pet will love these peanut butter dog biscuit recipes - they're just bursting with goodness and flavor! Apart from making very tasty biscuits, peanut butter can be very useful if your Cocker tends to spit out his medication (don't they all?). Simply take a small teaspoon of peanut butter, press the pill into the mixture, scoop off with your finger and feed it to your Cocker. I guarantee it; your Cocker's medication will disappear instantly! Tip: If you don't own non-stick bake-wear, you could use a lightly buttered piece of foil . Warm the honey and peanut butter until they become runny. Take one teaspoonful of the mixture and let it drop onto a non-stick backing sheet; continue until you've used all the dough. Place in the oven and bake 8 to 10 minutes. This recipe makes approximately 40 peanut butter dog biscuits depending upon how much you spoon out each time. Wow! I could eat these tasty little biscuits myself! 2 ripe bananas - the riper the better! Peel your bananas and slice into a large bowl or food processor. Add the peanut butter, egg, water, honey and baking powder and mix well. Add the cinnamon, powdered milk and oil and mix thoroughly. Add the oatmeal and the whole wheat flour and blend well. When the mixture is firm and pliable, knead for 5 minutes. Cover the bowl with a tea towel and allow the dough to rest for about 20 minutes. On a floured surface, roll out the dough to approximately 1/4" thickness. Using your bone-shaped cutters, cut out the biscuits and place on a non-stick baking tray. Place in the oven and bake on the middle shelf for 30 minutes. Switch off the oven and leave the biscuits in there overnight to allow them to harden. This dog biscuit recipes makes around 60 peanut butter dog biscuits depending upon the size of cutters you use. This is a savory biscuit your Cocker is guaranteed to love - especially as we've added tasty cheese to the recipe! Whisk the milk and flour until all the lumps have been removed. Add the chicken stock, peanut butter, Parmesan, and the egg white. Whisk (or mix in a blender) until it resembles a thick batter. Add the baking powder and pour small rounds onto a non-stick baking tray. 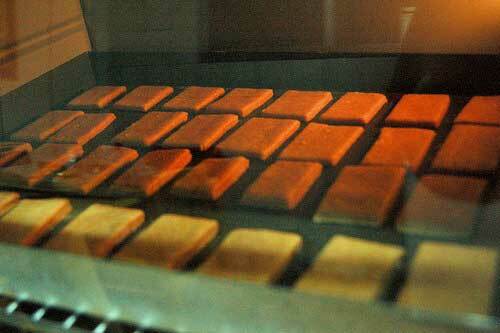 Bake in the oven for approximately 15 minutes, or until the biscuits have turned golden brown. When you taste these moreish biscuits you may not want to give them to your Spaniel - you might want to keep them all to yourself! Turn out onto a kitchen counter, lightly dusted with flour, and knead. Roll out the dough until it is 1/4" thick and then cut into the relevant shapes; use a sharp knife or a cookie cutter. Place the biscuits on a non-stick baking sheet and place in the oven. Bake in the oven for 30 minutes or until they turn golden brown. I hope you enjoy trying at least one of our peanut butter treats and if you'd like to try more, (and I think you will or at least your Cocker Spaniel will) why not try some of these scrumptious peanut butter dog biscuit recipes? Peanut Butter Dog Biscuits With Honey And Banana: These treats are packed with flavor; not only do they contain peanut butter, but there's honey and banana too. I bet you'd never have guessed that from the name? Peanut Butter Crunchies: This recipe uses crunchy peanut butter for that extra crunchiness! Peanut Butter And Banana Pet Biscuits - you'll be surprised at just how much your dog will love these treats - why not see for yourself? Alternatively, you may have a few delicious recipes of your own that you'd like to share with us. In which case, you can share your favorite dog biscuit recipes simply by clicking on the link below! Before you begin, I recommend you measure out all your ingredients - be organized! Always preheat the oven before you start your preparation for your dog biscuit recipes. If there are any scraps of dough left over after cutting out the biscuit shapes, gather them up, roll out again, and cut more biscuits! When the biscuits are cooked, switch off the oven and leave them inside overnight to cool. This will help to make the doggie treats crispy and crunchy - they'll also keep longer too! Store the cookies in an airtight container to keep them fresh and crunchy. 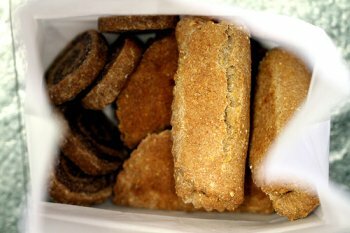 Refrigerating the biscuits will help them to stay fresh longer. 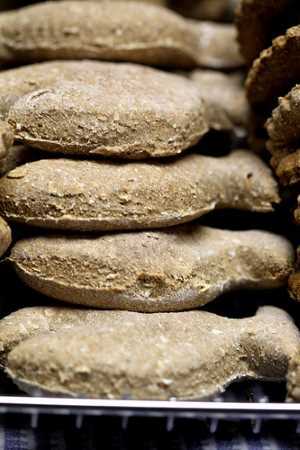 Home made dog treats can also be frozen and may be kept for up to 6 months. The number of treats our dog biscuit recipes make will vary, depending on how thickly or thinly you roll your dough and the size you cut your biscuits. We hope you enjoy trying our favorite dog treat recipes and we're certain your pet will enjoy eating them! When you've finished trying the above, there are lot's more delicious recipes for you and your Cocker Spaniel to enjoy - simply click on any of the links below! Easy Recipes For Dog Biscuits - these really are so easy to make. Recipes For Home-made Dog Treats - dog biscuits your Cocker Spaniel will love you for! Recipes For Healthy Dog Biscuits - as your pet gets a little older, it's very important to watch his health and his weight. These biscuits can help you do that, but don't overdo it. If you'd like to leave a comment about any of our dog biscuit recipes, or if you have a recipe of your own that you'd like to share with us, we'd love to hear from you - see our form below. Like To Share Your Favourite Dog Biscuit Recipe? If you do, we'd love to hear from you! Alternatively, if you'd like to comment on any of our recipes, you can also do that here - simply drop us a line, see below. For example, a photograph of your freshly baked dog biscuits, or a picture of your dog happily munching on a biscuit treat!